Three variations of a delicious appetizer. 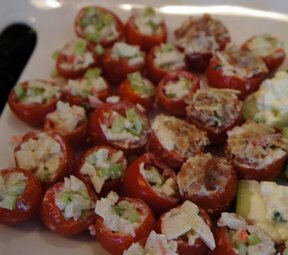 A crab salad stuffing, a cream cheese stuffing or a bacon stuffing make these cherry tomatoes gone in 60 seconds. 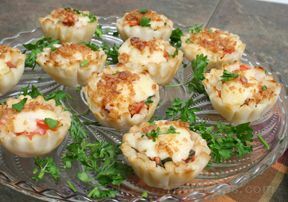 These appetizers are a little work but they are always a big hit. To prepare cherry tomatoes, cut a small portion off the bottom of each tomato so they will sit on a tray without rolling. Slice off the top of each tomato and carefully scoop out center seeds and pulp with the small end of melon scoop or sharp knife. Place each tomato upside down on paper towel to drain. Refrigerate until ready to fill. Using a tiny spoon, fill each tomato with filling of your choice. 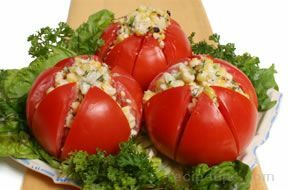 For the CRAB FILLING, combine all ingredients, using just enough mayonnaise to moisten and hold together. For the CREAM CHEESE FILLING, combine all ingredients and fill the same way. Sprinkle tops with chopped parsley and refrigerate for up to 6 hours before serving. For the BACON FILLING: combine all ingredients and fill the same way. "Not sure if the 5 minutes they were around was worth the 45 minutes of effort! The bacon ones were a bigger hit than the seafood ones but they were all gone in 5 minutes, so I guess they were a hit. 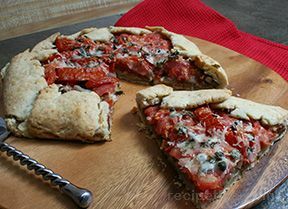 I used a strawberry huller to clean out the tomatoes - it was perfect."